You are here:Home Announcements Duolit quits the game. For real. Today is a HUGE day. Like, the kind of huge day that necessitates ticker tape parades, marching bands, and fireworks. Because the first three courses in our Weekend Workshop series (Facebook Facelift, Mailing List Magic, and Plan Your Own Blog Tour) are officially live on Udemy! Toni and I are SO excited to share these workshops with you that we decided NOT to do something that’s previously been a big part of our launch plans. There’s a tried-and-true strategy for selling more of anything. You create a sense of urgency by telling folks the price on a certain product is about to go up significantly. It works — we know, we’ve tried it. We’re not going to do it. Because honestly, we’ve poured months of hard work into what we’re about to unveil (our new Weekend Workshop series) and it deserves better than that. What are Duolit’s new workshops all about? Over the past three years, Toni and I have searched far and wide for the best way to share our self-publishing and book marketing knowledge and experience. Not because we don’t want to do the work for you (we’re happy to, that’s why we offer our Quick Fixes) but because we truly understand the do-it-yourself mentality. The D-I-Y spirit is in the genetic code of the indie author. You want to learn how to sell your books because this is your career. Your reputation is on the line, your dreams are at stake, this is your game to win. Our blog is a good start, a perfect stepping stone to beginning your path, but there are some important, in-depth topics that we just can’t cover in the 800 – 1000 words of a blog post. Some topics need videos, visuals, examples, tutorials, and worksheets. Some topics need to be covered in a way that’s interactive and comprehensive, but flexible — so you can fit them into your schedule. That’s how the Duolit Weekend Workshops were born. Every lesson is made up of three to five short videos you can work into your busy days wherever possible. You can complete all six lessons in two days or spread them out over a few weeks — you’re the boss, so it’s all up to you! These courses are NOT just fluff and theory. If you do your homework, you will come away from each workshop with an actual piece of your marketing plan (a thriving Facebook page, a growing email list, or a planned blog tour). You’ve been hanging around the Duolit blog long enough to know we’re not stiff or boring (more like super hilarious and awesome). Our personalities and cheerleader mentality come through in each of the workshops, sharing information in an engaging format that offers you added encouragement for conquering your hurdles. Over the next couple of days, we’ll be going more in-depth about exactly what will be covered in each of the three courses, but the above list is guaranteed for every workshop. This workshop venture is new territory for us. We wanted to present our content in the best possible format for you to enjoy. In the end, that meant we couldn’t simply set them up here on our website. Instead, the Weekend Workshops are hosted on an amazing site called Udemy that features web-based courses from all over the world shared through high-quality videos you can watch on your PC, laptop, tablet, or smartphone. We’ve also included lots of downloadable bonuses — audio versions of every video, PDF slides for every presentation, quizzes to check your progress, and all sorts of other goodies like checklists, resources, tutorials, templates, schedules, and more. 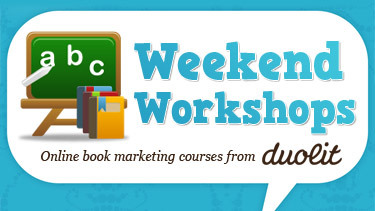 That means no matter your location or learning style, the Weekend Workshops will fit in with your life! Like we said, we’re not playing the “Oh-no-the-price-is-going-up-tomorrow!” game anymore. Each of these three workshops is $74. Period. They’re packed with value far beyond that price point — not only do you get a tangible piece of your marketing puzzle (a Facebook page, a mailing list, a blog tour) out of every workshop, you also gain the knowledge behind it. So no matter how many books you write, you’ll be able to replicate your success with the skills you learn in every Duolit workshop. I could keep talking about these workshops forever, y’all! But if you’ve been around Duolit for a while, you don’t need a lot of convincing to know that these workshops are a solid investment in your author career. Remember, we’ll cover every workshop in detail right here on the blog, tomorrow through Friday, so stay tuned for those features! Do you have any questions about the Workshops? Are you excited to get started? Let us know in the comments below!